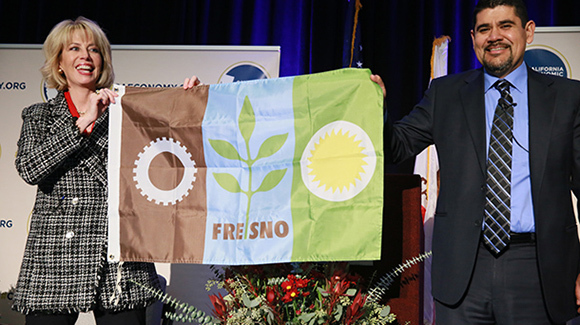 FRESNO, Calif. (Nov. 16, 2018) - The 2019 California Economic Summit annual meeting will be held in Fresno on November 7-8. It marks the first time the Summit will be hosted in the Central Valley. The announcement was made by California Forward and the California Stewardship Network today at the conclusion of the 2018 Summit in Santa Rosa. The two-day event attracted more than 500 public, private and civic sector leaders from across California. The Summit has emerged as the only statewide meeting with a comprehensive agenda for taking on the challenges of our time: reducing California’s highest-in-the-nation poverty rate; rebuilding our middle class; restoring economic security and building community resiliency in a time of increasing global integration; greater automation; and climate change. Newsom has been integral to the California Economic Summit since it began seven years ago. The Summit has championed initiatives aimed at the triple bottom line: seeking to simultaneously advance economic growth, ensure environmental quality and provide opportunity for all. A highlight of the 2019 Summit will be the release of the “California Dream Index,” which will give Summit attendees an opportunity to help map pathways for restoration of upward mobility for all Californians. Fresno and the Central Valley have been well-represented on California Forward’s leadership Council. In addition to Pete Weber, Central Valley Community Foundation CEO Ashley Swearengin currently serves, while Judge Chuck Poochigian and former Assembly Member Juan Arambula are both former members. The Fresno Business Council is one of 15 regional organizations to make up the California Stewardship Network.